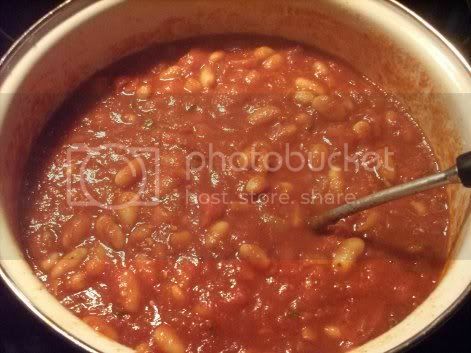 White Bean Chili: Red Hot or Not? I love beans. I’ve eaten them with gusto since first going vegetarian when I was a teenager. Bean burritos, bean quesadillas, beans and rice, and of course, bean chili. There are so many different kinds of vegan chili, and I’ve tried a bunch of them with great success. Black bean, red bean, three bean, chickpea and veggies, just veggies, with TVP, with tofu, with seitan…there is a lot of chili eating in the Quantum Vegan household! 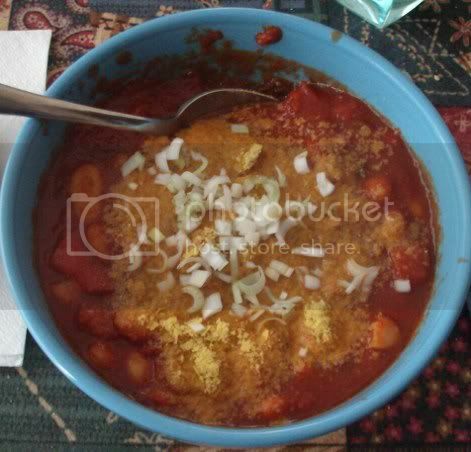 Two things drew me to a new, or rather new-to-me, recipe for “Red Hot White Bean Chili” in Vegan Fire & Spice. To me, hot food is a welcome thing. If a dish like chili or curry doesn’t make my nose run when I eat it, it’s not hot enough. So the idea of “red hot” was definitely a draw. The other was simple: I wanted something with white beans in it! It took a little while of looking up “white beans” in my cookbook collection before I settled on this recipe. Nothing sounded quite right, and many required ingredients we didn’t have. But when I discovered this one and also discovered that it called for fresh chiles, I made one of those special trips to the store. You know those…the ones you know you shouldn’t waste time making, but you just have to have all right ingredients to make a dish taste perfect. I settled on two rather promising serrano chiles and also picked up some scallions for garnish as per the recipe’s suggestion. Never having consciously used serrano peppers before, I was happy with the way they smelled as I minced them–nice and spicy! But even with both of them and a generous dose of cayenne, the chili did not turn out “red hot.” Spicy, yes, but red hot? Alas. 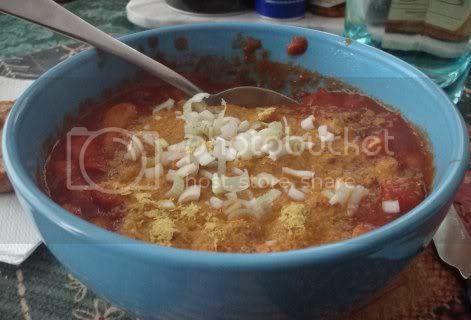 I love chili, moderately hot, this looks so hearty and delicious.